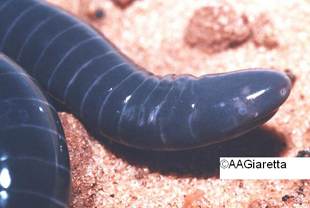 The Caecilian [wiki] is an amphibian that superficially resemble earthworms or snakes. But because it mostly lives hidden in the ground, it has become the least explored order of amphibians, and widely unknown. Not until recent, scientists discovered that it has a bizarre parental behaviour--the caecilian mother allows her young to peel off and eat her skin. It has been filmed on camera by building a set which resembled the creature's living environment for the broadcasting network's Life In Cold Blood series. » Crossbow Cannibal - What is this all about?